A Border Patrol special operations supervisor shows the entrance to a tunnel leading to Mexico. (NY Post) SAN DIEGO — A nearly half-mile-long tunnel leading from Mexico to San Diego was discovered and more than a ton of cocaine and 7 tons of marijuana was seized, the US Attorney’s Office said Wednesday, April 20. Six people were arrested. 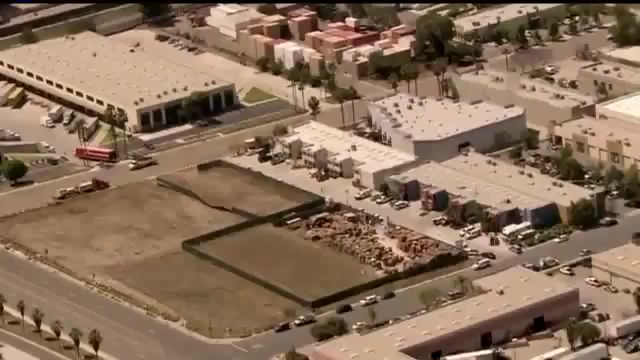 The tunnel extends 300 yards from a house in Tijuana, Mexico, to the border and then 500 yards on the US side to a fenced lot in a San Diego industrial area. The tunnel was equipped with a rail system, ventilation, lights and a large elevator, officials said. The exit on the US side is about 3 feet wide and was covered by a trash bin. 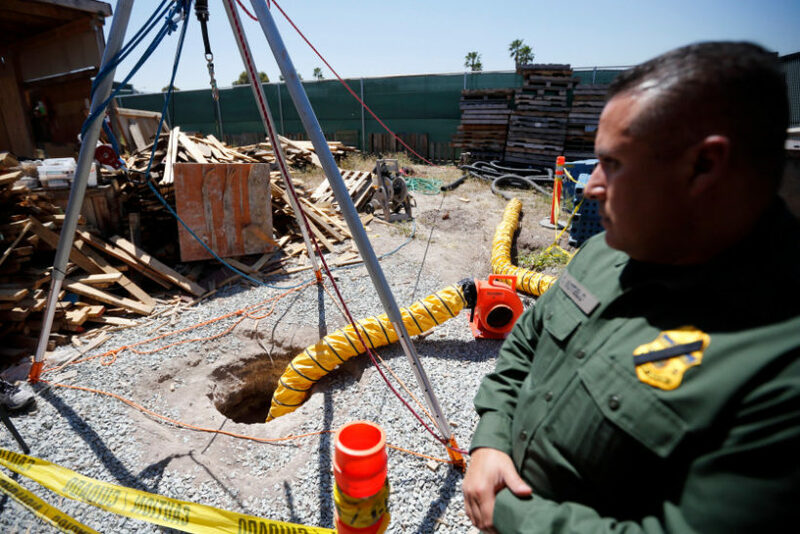 Six people arrested in San Diego on Friday were charged with crimes involving drugs and construction of the tunnel. The discovery demonstrates the enduring appeal of tunnels to smugglers, despite the significant time and money required to build one. Dozens of tunnels have been found along the US-Mexico border in recent years, some equipped with hydraulic lifts and electric rail cars. Most of the tunnels found were in California and Arizona, many of them incomplete. (London’s Daily Telegraph) – Israel is increasingly concerned about the presence of Isil terrorists on its north-eastern border in the Golan Heights – only 20 miles from the town of Safed. The Islamic Yarmouk Martyrs Brigade has declared allegiance to Abu Bakr al-Baghdadi, the self-styled “caliph” of the Islamic State of Iraq and the Levant (Isil). This group has between 600 and 1,000 fighters within striking range of Israel. They are located in the southern Syrian Golan Heights, near the triangle where the Israeli, Jordanian and Syrian borders meet. “We are observing and watching them to make sure there are no surprises,” said Major Arye Sharuz Shalicar, an Israeli military spokesman. Israeli defense officials are worried that this Isil unit may have acquired poisonous gas from Bashar al-Assad’s regime. If the group approaches an “experimental or operational capability with chemical weapons,” then Israel will take action, according to anonymous officials quoted by Channel 10 television. In among the radical Sunni groups is the Lebanese Shia terrorist organization, Hezbollah, which also operates in southern Syria. At present, Hezbollah fighters are “obsessively” monitoring Israeli soldiers from across the border, perhaps in preparation for another conflict. (AFP at Yahoo News) ROME – Italy is to introduce the fingerprinting of migrants crossing the Mediterranean as soon as they are picked up by rescue boats, officials say. The move could help to reduce mounting tensions between Italy and its EU partners over the large numbers of migrants who arrive in Italy but are not registered here and then travel on to northern Europe. If they are not registered in Italy, neighboring countries like Austria and France and popular destination states like Germany and Sweden do not have the option of sending them back to Italy. In theory they should be able to do this under the EU’s Dublin convention rules governing asylum claims. 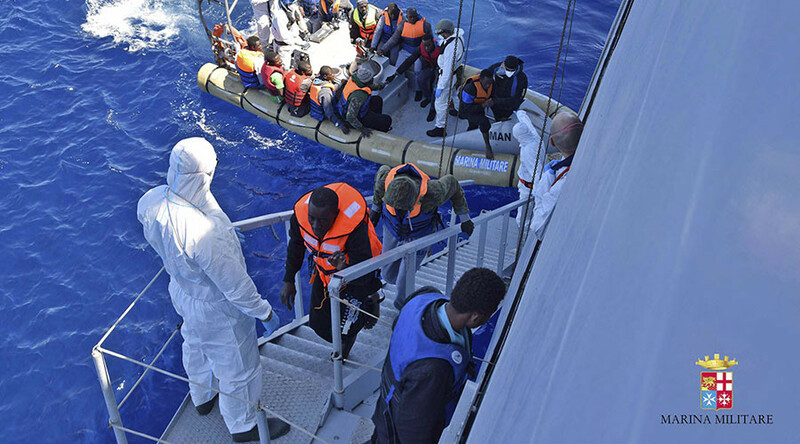 Migrants sit in a rescue boat during a rescue operation by Italian Navy vessels off the coast of Sicily in this April 11, 2016 handout picture provided by Marina Militare. The Italian move follows talks on Wednesday, April 28, between Interior Minister Angelo Alfano and EU migration commissioner Dimitris Avramopoulos in Sicily, where most migrants arrive and are processed at “hotspot” reception centers. “With this we will now have hotspots at sea,” Alfano said. It was not clear if the policy will be applied systematically — migrants picked up at sea are often in a traumatized state and asylum seekers from Eritrea [who are economic migrants] notably generally refuse to have their prints taken because they want to make their applications elsewhere. Italy was warned last year by the European Commission that it must make its registration procedures more efficient. But Italian officials say the country cannot cope alone with the migrant influx. With Austria on the verge of introducing migrant checks at its border with Italy in the Alps, there is mounting concern in Rome that the country’s overcrowded reception facilities could soon have to deal with tens of thousands of additional asylum seekers. The tensions have given added urgency to attempts to find a lasting solution to the crisis and Italy is pushing a plan to introduce NATO naval patrols off Libya in time for the peak summer season for people smuggling. Modeled on an existing NATO operation in waters between Turkey and Greece, the plan…is expected to be approved by alliance leaders at a summit in Warsaw in July. b) Describe the latest tunnel reported on in this news brief. Be specific. Be specific. c) What charges were brought against the 6 people who were arrested? d) Why have so many of these illegal tunnels been built between the border in the San Diego-Tijuana region? e) Ask a parent or grandparent: How important is it to you that the federal government be able to secure our border? Explain your answer. b) For what reasons is the military concerned about the presence of Islamic terrorists allied with ISIS on the north-eastern border? c) How is the military addressing the threat? d) The liberal position is that Israel “occupies” the Golan Heights. However, conservatives explain that Israel conquered the Golan during the Six Day War as it defended itself against its much larger Arab neighbors who fought against Israel to destroy it. How important do you think it is for the U.S. to strongly stand by our close ally Israel (the only Democracy in the Middle East)? Explain your answer. b) How many people from all over the world have reached Italy on boats from Libya in the past 2 years? c) Why is Rome concerned that its overcrowded reception facilities could soon have tens of thousands of additional asylum seekers? d) What two plans has Italy proposed to slow the number of people coming to Europe? e) Ask a parent, what do you think of Italy’s proposals? Please explain your answer. Read about the 1967 Six Day War between Israel and her Arab neighbors including Egypt, Jordan and Syria at sixdaywar.org/index.asp. Vastly outnumbered and surrounded, Israel won control of the West Bank, Gaza and the Golan Heights. 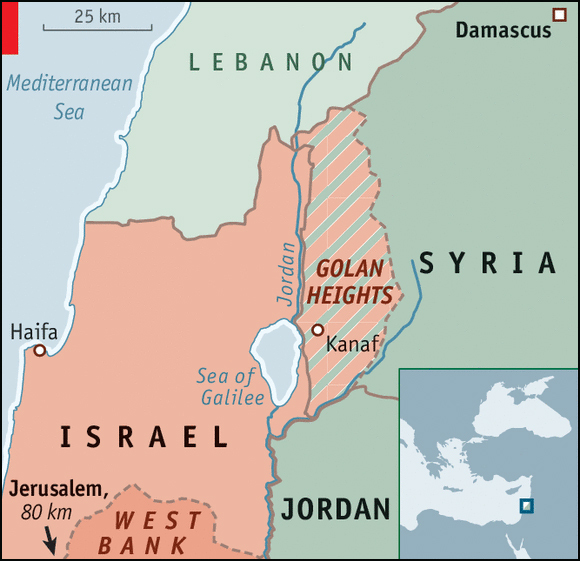 Read a March article “On Golan Heights, Israeli Defense Force (IDF) fights to keep Israel safe and out of Syria” for a detailed report on the terrorist threat on Israel’s border. Read an explanation about the difference between a migrant and a refugee.